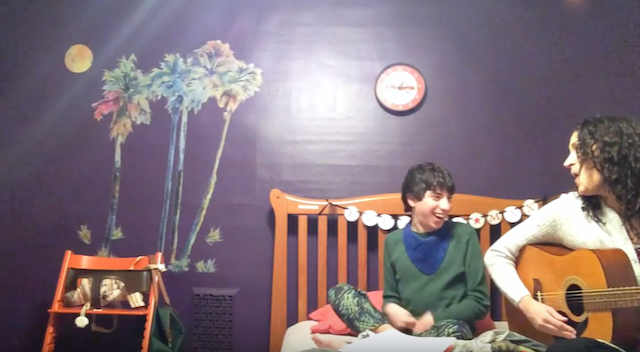 I've happily shared videos over the years of Max in music therapy, like this one of him belting out Let It Go. While he has sang some words before he's ever spoken them—speech progress is one benefit of music therapy—he has also just flat-out enjoyed expressing himself this way, as music enables people to do. In the Dominican Republic we said "Hola!" I came home from work the other night, watched the video on his iPad and had all the feels. This boy, the one whom I used to pray would say "Mommy" and "Daddy," is now using Spanish words. Before we'd left the Dominican Republic, he'd been saying "hola!" to everyone and here he was, mucho-bueno-ing. Learning a second language hasn't been on our wish list, not because we haven't thought Max was capable but because speaking and understanding English has been enough to focus on. Amanda noted that Spanish is a great language for Max, since so many words ends in vowels; Max is good with enunciating vowels, less so with consonants. Once again I will say: You just never know what the future will bring. Incréible! And of course queso is cheese - so quesadilas are very cheesy! Yours truly was encouraging a friend to put their subtitles in literary Arabic recently.